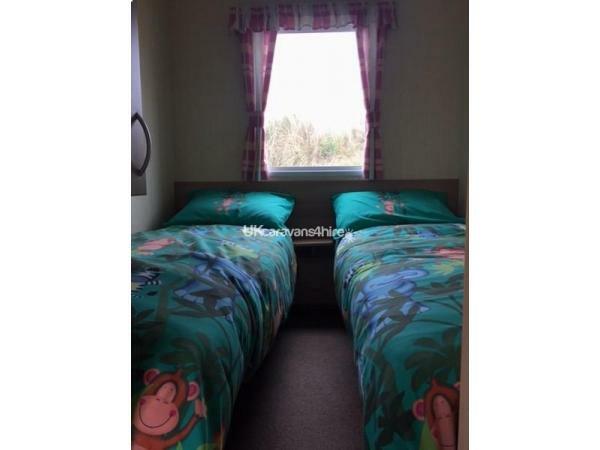 Caravan 335 is a pet friendly, 3 bedroom, 2 bathroom caravan for hire on Haven's all-action Perran Sands Holiday Park in Cornwall. 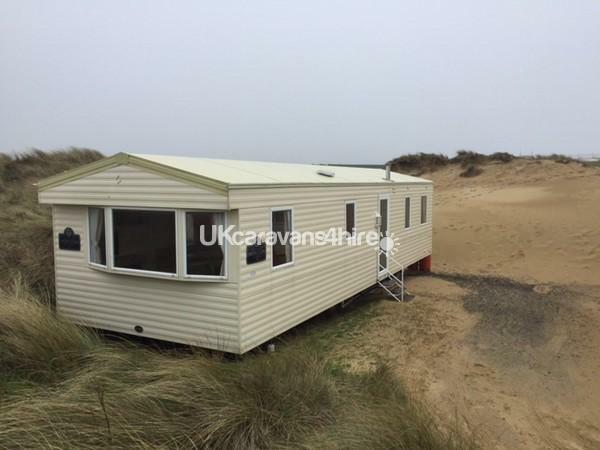 Situated a minutes walk from all amenities, yet not disturbed in this secluded location in the sand dunes. Also available are 2 x chalets on Perran Sands. 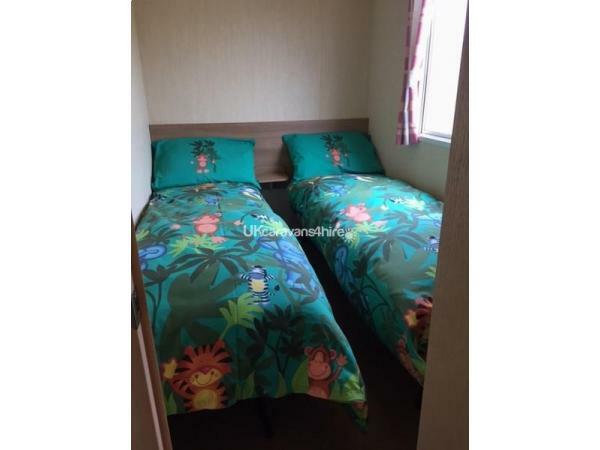 One is a luxury accommodation to sleep 4 people and the second Chalet is able to sleep 5. Both have had extensive refurbishment. Pets are not allowed in the Chalets. Please ask for details. 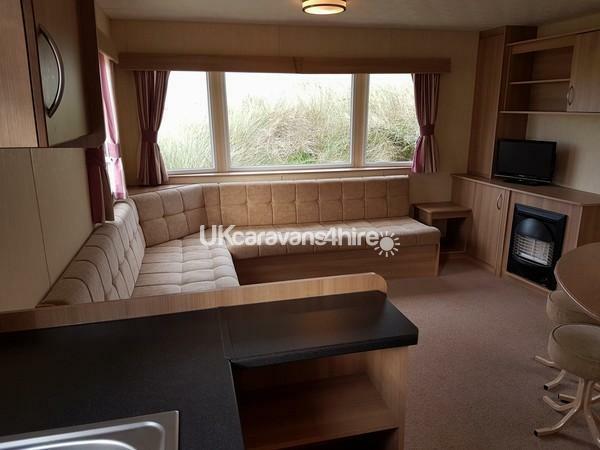 With so much to do on the holiday park, and even more in the beautiful surrounding areas of Cornwall, Caravan 335 is the perfect place to spend your holiday. With 3 bedrooms (one double and two twin rooms) there is plenty of space for the whole family. There is also a pull-out bed in the lounge area for extra guests. You will find a great size bathroom with shower, WC and sink, plus a second WC and sink to avoid those inevitable clashes! Panel heaters are fitted in the bedrooms to keep you warm in the colder months, with a fire in the lounge area. The kitchen is fully kitted out and contains a full size cooker, fridge and microwave. You are very welcome to bring your dog to stay in Caravan 335 and as Perranporth is such a dog friendly place, you will be able to take them with you pretty much everywhere you go - including to the legendary Watering Hole bar on the beach (check out their website). The Cafe bar on site at Perran Sands is also dog friendly and has been known to have special doggy treats at the Bar! On site you will find a fabulous themed restaurant, large entertainment complex including swimming pool. Entertainment passes are required for the main Entertainment complex and can be purchased at the holiday park reception. There is an amusement arcade, Papa John's Pizza (who deliver to your caravan/chalet), fish & chip shop and a fantastic fish restaurant that is open during peak season. You will also find a fully stocked grocery store and laundarette. 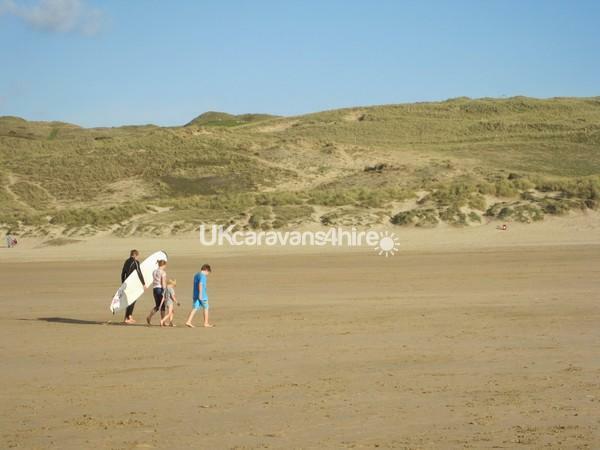 Perran Sands Holiday Park is situated on the amazing Perranporth Beach. The site itself is a conservation area with lots of nature trails to enjoy. There are lifeguards on duty on the private beach area from May to September. The main beach in Perranporth has lifeguards on duty all year round. There is a regular bus service that comes onto the Park and there are local taxi services that charge approximately £6 to bring you back up from Perranporth right to your door. Cornwall is the most amazing place to be and there is something for everyone, from coastal walks to theme parks, and check out the Seal Sanctury in Gweek (free entry with Merlin Annual Passes).